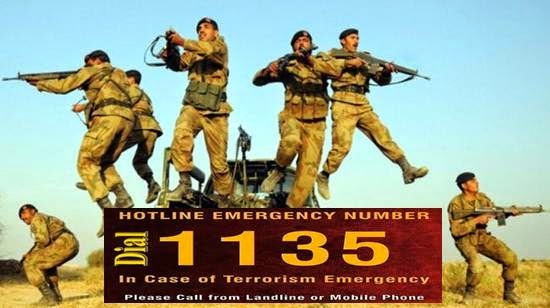 Pak Army has created Hotline 1135 in case of any terrorism emergency. People can use this number if they have any information about any terrorism activity. 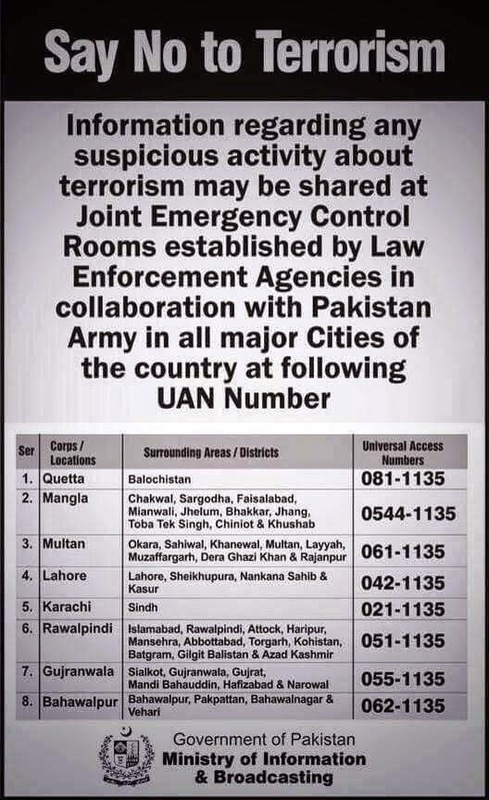 Information regarding any suspicious activity about terrorism may be shared at Joint Emergency Control Rooms established by Law Enforcement Agencies in Collaboration with Pakistan Army in all major cities of the country. Eight (08) Joint Emergency Control Rooms are established in Quetta, Mangla, Multan, Lahore, Karachi, Rawalpindi, Gujranwala, Bahawalpur for surrounding areas and districts to protect whole Pakistan from terrorism. Region-wise following 08 Universal Access Numbers can be dialed. These numbers can be dialed from any PTCL landline or any Mobile Phone.